Hikes, animal tracking programs, games and more! T he Michigan Department of Natural Resources will highlight the wonders of Michigan's mammals during Michigan Mammals Week July 10-16 in a handful of Michigan state parks. The family-friendly programs are free for campers and visitors. The annual program provides a fun and educational experience for the whole family. The week of hands-on programming will take place in 31 Michigan state parks and will feature hikes, animal tracking programs, games and much more. 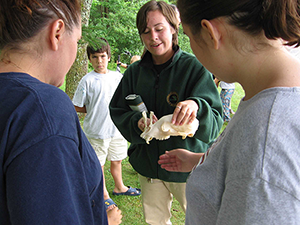 Michigan Mammals Week and many other programs are led by state park Explorer Guides and park interpreters who work in the park and present a variety of outdoor education opportunities in more than 30 Michigan state parks Memorial Day through August. These enthusiastic, nature-minded folks lead hikes, activities and programming that shine a spotlight on each park’s unique resources. To find a program in your favorite park, visit www.michigan.gov/natureprograms and click on the link “Michigan Mammals Week” under Special Programs and Activities. To see all available Explorer programming throughout the summer, view the interactive map or alphabetical list of parks.